Enthoo Evolv Shift combines the striking design of the Evolv series with new, innovative features to make for a truly eye-catching Mini-ITX case. 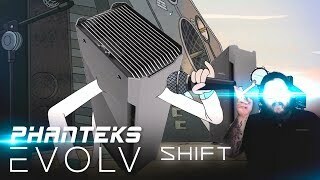 The Evolv shift has a very small footprint, nevertheless, thanks to its clever layout, it is capable of holding an extensive range of powerful gaming hardware. The shift can also be placed horizontally, cutting an attractive figure in any living room with its combination of aluminium and tempered glass. More links for "Enthoo Evolv Shift Mini-ITX Tempered Glass Case - Gunmetal Grey"
The tempered glass, aluminium frames and just that clean look. It just modern art sitting in your desk or living room. I just loved this the design, but it has its problems as well, mainly you have to be very good at cable management, in order to have proper fitting. It's different space to work with since of the vertical layout then normal layout. Overall, its a work of art, with led strips.